Trending: Recycling or upcycling anything to give new life to old things is still ‘in’. 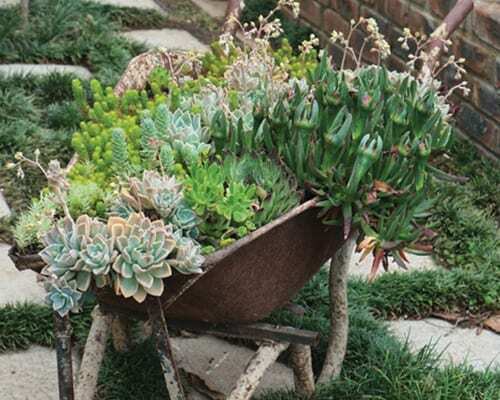 Use old wheelbarrows, boots, leaking buckets or discarded kitchenware as containers for herbs or succulents. Remember: If it’s hollow and can hold soil, it can be a container. But be careful not to dot them around too haphazardly or your garden or patio will begin to resemble a junk yard! Take time to display everything you’ve planted and grown together in an artistic way to please the eyes and other senses. Repair and paint old trellis frameworks or burglar proofing panels and use them as a framework for small vertical gardens against a wall to grow herbs, or fix them horizontally as hanging places for light-weight hanging baskets or very fashionable kokedama.